University of California Press, 9780520297371, 392pp. Adventures of a Jazz Age Lawyer is a lively narrative exploring the coming-of-age of institutions, archetypes, and attitudes that define American popular culture. This story is revealed through the career of legal giant Nathan Burkan, whose clients included Charlie Chaplin, Al Jolson, Frank Costello, Victor Herbert, Mae West, Gloria Morgan Vanderbilt, Arnold Rothstein, and Samuel Goldwyn. Burkan was one of the principal draftspeople of the epochal Copyright Act of 1909 and the guiding spirit behind the American Society of Composers, Authors, and Publishers, which was established to protect the rights of composers whose music was being played in cabarets and theaters without compensation. Burkan's groundbreaking work laid the legal foundation for the Great American Songbook and the Golden Age of Hollywood, and it continues to influence popular culture today. Gary A. Rosen tells stories of dramatic and often uproarious courtroom confrontations, scandalous escapades of the rich and famous, and momentous clashes of powerful political, economic, and cultural forces from which the United States emerged as the world’s leading exporter of creative energy. 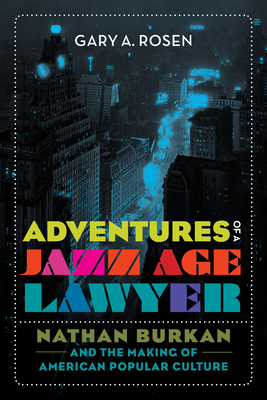 Adventures of a Jazz Age Lawyer is not merely an engaging look at the life of Nathan Burkan, but a history of entertainment and intellectual property law in the early twentieth century. Rosen takes us on a fascinating romp through an era of American culture that promises new discoveries for anyone interested in the spirit of the Jazz Age. Gary A. Rosen has practiced intellectual property law for more than thirty years and is Adjunct Professor of Law at Kline School of Law at Drexel University. He is the author of a book on popular music and copyright, Unfair to Genius: The Strange and Litigious Career of Ira B. Arnstein, and he writes a blog on law and popular culture called Jazz Age Lawyer (www.jazzagelawyer.com).